Though two of the most popular members of the Kapoor clan (namely Kareena Kapoor Khan and Ranbir Kapoor) yet remain aloof from social media, their other family members often indulge in some interesting banter on these networking sites. While her hubby Rishi Kapoor is often caught in a cross-fire, thanks to his uninhibited style of sharing his thoughts, Neetu unleashed her mischievous side, a rare occasion, during Karva Chauth recently. Several Bollywood stars celebrated the Karva Chauth in an elaborate manner and the cool mom of the Kapoor clan, Neetu Kapoor shared a hilarious meme on her Instagram page. 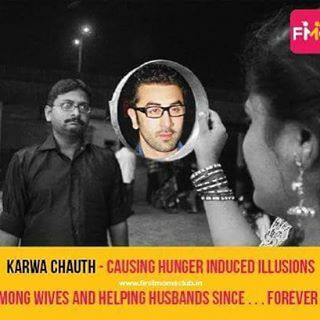 The former actress shared a witty meme of a woman following the rituals of Karva Chauth, a fast observed by women for the long life of their husband, with the face of Ranbir Kapoor posted in front of her. While she did not caption it, she merely added a few emoticons to express her emotions on the same. Ranbir Kapoor, who was last seen in Tamasha, is currently gearing up for Ae Dil Hai Mushkil which is caught in the midst of a major controversy, in the wake of the ban imposed on Pakistani artists.